Le Grand Sérum is the ultimate Finishing Sérum; this sublimating elixir was made specifically for Madame Allouche. 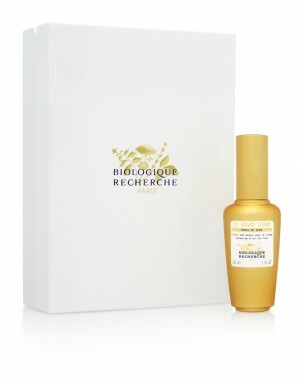 Thanks to a formula boasting the highest concentrations of active ingredients among all Biologique Recherche serums, Le Grand Sérum is a real ubiquitous serum with anti-ageing, protection and hydration properties. Thanks to its 5 formulation stems, it provides a global and total action, and is a concentrate of softness and long lasting brightening effects. This unique product is a combination of pleasure and high performance. Le Grand Sérum is presented in a golden glass bottle with 30 ml capacity, which comes in a prestige box in white lacquered wood. Agents against the signs of epidermal premature aging: Amino Acids, Extracts of Elder, of Chestnut, of Tropical Almond and of Watercress, Extract of Myrrh, Myrtle and Onion, Hexapeptides. Anti-free radicals agents: Mimosa, Cranberry and Wasabi Extracts. Soothing agents: Kudzu Extract and Polysaccharides. Moisturising agents: Natural Moisturising Factor (NMF), Hyaluronic Acid and Silk Extract. Toning agents: Extracts of Witch Hazel and St. John’s Wort, Black Crowberry Juice.